1 of 2 Heat oven to 350 degrees . Spray 2 doughnut pans well with baking spray. Into a large bowl, sift together flour, sugar, baking powder, cinnamon, nutmeg and salt. In a small bowl, whisk together egg, milk, melted butter and vanilla. Stir wet mixture into dry ingredients until just combined. 2 of 2 Spoon batter into prepared baking pans, filling each one a little more than three-quarters full. Bake at 350 degrees for 17 minutes, until a toothpick comes out clean. Allow to cool for 5 minutes, then tap doughnuts out onto a sheet pan. 1 of 1 Melt butter in an 8-inch saute pan. Combine sugar and cinnamon in a small bowl. 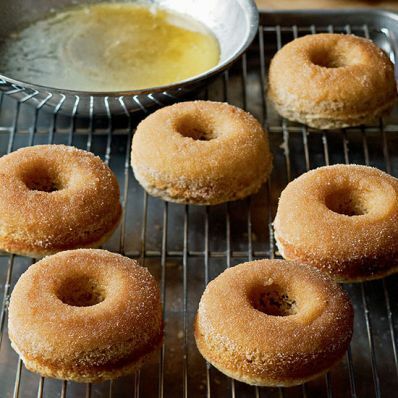 Dip each doughnut first in butter and then in cinnamon sugar, either on one side or both sides.